Onychauxis, which is the medical term for an overgrowth or thickening of the nail, reveals nothing to the casual observer, the tech, or the doctor. Many times, in fact, onychauxis is a natural part of aging. It is easy to see how a client or a tech could overlook the condition as harmless and treat it as little more than an unsightly growth of the nail. However, onychauxis can be a secondary symptom of a larger problem, so it shouldn’t be dismissed too easily. Onychauxis can be caused by something as memorable as blunt trauma or as innocuous as microtrauma (from tight shoes, for example). 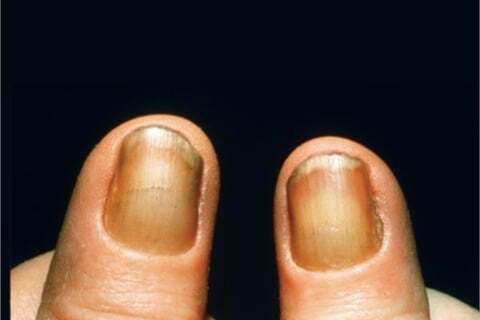 However, onychauxis can also be caused from more serious issues that affect the nail bed and skin. “Fungus, yeast, and psoriasis can all be present on the nail, the nail bed, or on the skin surrounding the nail, all of which will thicken the nail plate,” says Dr. S. A. Schumacher, a podiatrist at Achilles Foot Health Centre, in Surrey, British Columbia, Canada. Onychauxis may also indicate a more serious, systemic problem, such as diminished circulation, though this is the least likely cause, says Dr. Schumacher. Since skin issues like the ones mentioned above almost always cause the nail to thicken, they must be treated before trying to beautify a nail distorted from onychauxis. “Onychauxis can sometimes be cured,” says Dr. Schumacher. “When a nail is thick because of a fungal infection, for example, treatment of the infection may cure the nail.” In cases like this, the nail may be able to grow in healthy after the primary condition has been resolved. However, if onychauxis is caused by trauma and the matrix is damaged, it’s more likely that the thickness will need to be maintained through regular manicures or pedicures, because the nail may continue to grow in thicker than normal nails. Since a doctor must determine a cause before treatment is recommended, there is not a standard treatment for onychauxis. A nail tech can definitely help the look of nails affected with onychauxis, says Dr. Schumacher. However, techs should encourage their clients to visit a doctor to get the nail assessed before performing any nail service on the client. Dr. Schumacher gives a couple reasons for techs to proceed with caution. First, a doctor will be able to determine the cause of discoloration and thickness. There may be damage to the nail bed, and it’s possible for a tech to begin to break through the nail as she is filing. “Depending on what’s going on under the nail,” he says, “blood could squirt through when the nail is being thinned.” Once a doctor has ruled out larger problems, such as a skin condition, fungus, or melanoma, a nail tech can have confidence that a manicure or pedicure, or the application of nail product, won’t harm the client. Second, if a tech can build a reputation for being conservative about performing services on clients with nail conditions, she will gain the respect of the doctor. The benefit of this is that the doctor will be able to refer clients to her salon, knowing the techs there can be trusted to refer clients to a physician instead of trying to treat a condition in the salon. Once a doctor has determined no secondary problems are present, techs can do what they do best: make the nails look beautiful. The nails may take more time because of the thickness and possible deformity of the nail. With perseverance, techs can often make a client’s natural nail look thin and healthy. Sometimes onychauxis will be so severe that no amount of filing will make the natural nail beautiful. In situations like that, adding an enhancement to cover the damaged fingernail or toenail can greatly improve the look of the nail, and the confidence of the client. As long as the skin is healthy surrounding the nail, adding an enhancement is an excellent remedy to the often unattractive look of onychauxis. Dr. Schumacher offers one more piece of advice to techs: Proactively plan for clients who may develop conditions such as onychauxis. Techs can do this by operating a salon that has above-industry standards for sanitation and protection. “At least once a week I have a patient come in and tell me that the condition on her nails is from a salon,” says Dr. Schumacher. “That may not be true, but in the mind of the client, her problem is the direct result of a visit to the salon.” He is quick to say that conditions like onychauxis that prompt clients to seek a doctor’s diagnosis do not necessarily come from the salon. However, it’s less likely clients will entertain that possibility if they have confidence in their salon’s commitment to cleanliness. Onychauxis can be the result of a larger problem. Techs should encourage clients to have the nail assessed by a doctor before nail enhancements are applied.